The red Rakshi of fire! 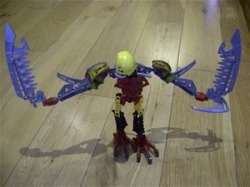 and one of my latest Bionicle's. Earth breaking sword's that stick in the ground to blow it up. 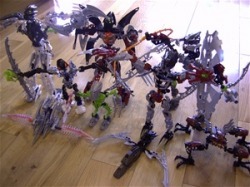 This was the first Bionicle i uploaded on Bonicle.com Gallery and so was Tathix. Toa rock spider, break's stone to shoot. 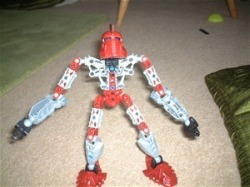 This one one of my first Bionicle's i uloaded on Bionicle.com and so was Takamon. 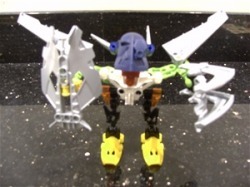 He is a servant of Takanuva. 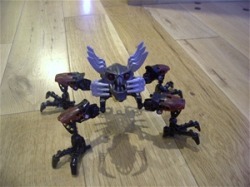 When i done that i ment Makuta not Takanuva. They are all getting ready for a big battle. If you can see at the back there's Takanuva and Makuta Icarax. 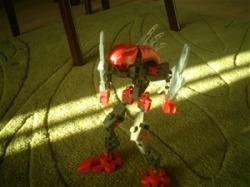 This is what Tahu looked like when he was putting the key stones in the coderex and then fell down it! 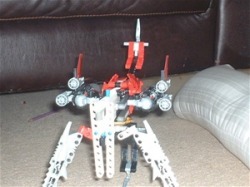 When Tahu fell down the coderex he found this amazing vehicle, he thought it was a miricle. 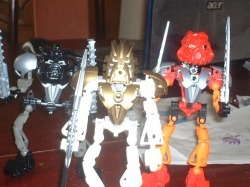 Onua Nuva, Tahu Nuva and Takanuva all getting ready to battle.